Walking through the icy streets of Park City during Sundance you're liable to run into anybody. Well, this year you might have accidentally bumped into Supreme Court Justice Ruth Bader Ginsburg, who was on hand to help promote RBG, the new documentary her history-making life and career. At the age of 84, U.S. Supreme Court Justice Ruth Bader Ginsburg has developed a breathtaking legal legacy while becoming an unexpected pop culture icon. But without a definitive Ginsburg biography, the unique personal journey of this diminutive, quiet warrior’s rise to the nation’s highest court has been largely unknown, even to some of her biggest fans – until now. RBG is a revelatory documentary exploring Ginsburg ‘s exceptional life and career from Betsy West and Julie Cohen, and co-produced by Storyville Films and CNN Films. 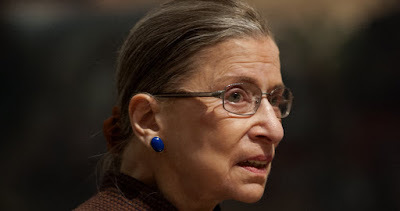 Directed by Betsy West and Julie Cohen, RBG opens May 4th in select theaters. That's right, this is the movie that really ran off Avengers: Infinity War.